Mrs. Heston had provided an excellent buffet lunch which was taken standing up, people moving about with plates of chicken salad and cold veal pie, in a general air of heartiness. 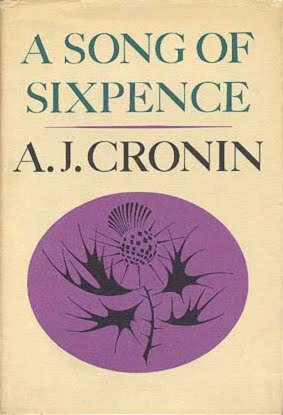 A Song of Sixpence is a highly autobiographical tale so I knew that everything was going to turn out alright. Yet there were so many trials and tribulations I couldn’t help get caught up being worried for young Laurie Carroll, Cronin’s alter ego. If this Cronin book hasn’t already been adapted to the screen it would make a wonderful film or mini-series. The thing I liked most about this book was the way in which Carroll/Cronin’s wariness of the world quickly dissipates in the face of something new and interesting. And once his interest is piqued, his enthusiasm is boundless and he becomes a sponge for knowledge. I suppose I feel like I was a bit like Carroll as a child, or I wish I had been like Carroll as a child. I had the enthusiasm and interest in learning but my tendency was to go broad rather than deep so the hours and hours I spent in the library, while enjoyable, didn’t necessarily prepare me for some future academic or professional pursuit. Carroll/Cronin’s early interest in the life sciences led to a medical degree. My early interests just helped set me up for my life as a dabbler. A little of this, a little of that. Still, I can’t complain too much, the process has been enjoyable. The other thing I really appreciated about this book was the adults who took an interest in young Carroll. Most notably Miss Greville the downstairs’ neighbor. Her quest to turn Carroll into the Spartan ideal of youth and her active interest in him as both instructor and patron is heartwarming while it lasts. No spoilers here. Overall, a delightful, well-written, and yes, despite the ups and downs, a rather cozy coming of age tale. What more could I ask for? An good old fashioned read and none the worse for that! If I'm looking for nostalgia , then A.J. Cronin is a good bet , since I grew up in Scotland . Thankyou for the comment on my blog . I'm now investigating something called the Portfolio plan . Which , suitably , given the Cronin , relies fairly heavily on oats and porridge !! So, it sounds like AJ Cronin is a good bet for a cozy read. Can never get enough of that.